As my mortar board came crashing down to earth, so did I. The sudden realization: I had been set free into the real world, left to discover and pave my own way. I immediately recruited the assistance of Google and, by chance, uncovered the mystery that is medical communications. Before long, I found myself on the doorstep of Synergy Vision, with an abundance of stationary and an eager and open mind. The transition from university to the working world can be a shock to the system. However, from my experience so far, the two aren’t so distantly related. When you start university, you’re essentially running blindly into the unknown. New place, new people, new information. However, you’re never alone – there’s always someone on hand to help. I have quickly come to realize how essential effective team work is to med comms. No project could be completed without a helping hand from several team members. Whether it’s writing the content, creating the artwork or interacting directly with the clients, all members of the SV team must communicate with each other to achieve goals and exceed expectations. As with university, med comms is all about time management. Clients have deadlines, and these must be met. That means, in order to survive in the industry, you must be flexible and able to multi-task like a pro. Working on multiple projects at a time is standard practise, and a skill I’m excited to put to the test. I have learned in my short time at SV that organization is key to success. Not only does this help you stay on top of project work but, also, your time is money – literally! It’s enough to encourage anyone to be super-organized. Essentially, you go to university because you’re hungry to learn, and in med comms it seems a constant desire for knowledge is an excellent attribute to possess. Science is a dynamic and ever-changing field, which means the possibilities to learn are endless. If you’re a medical writer, for example, you’ll be required to constantly be developing your knowledge of a variety of therapy areas. So, as much as it’s important to be interested by your degree choice, its vital to be interested in the science behind med comms, as only then will you be able to produce the highest-quality work. University equipped me well for the transition from studies to med comms life, and SV has softened the blow that is reality. I feel like I’ve landed on my feet. 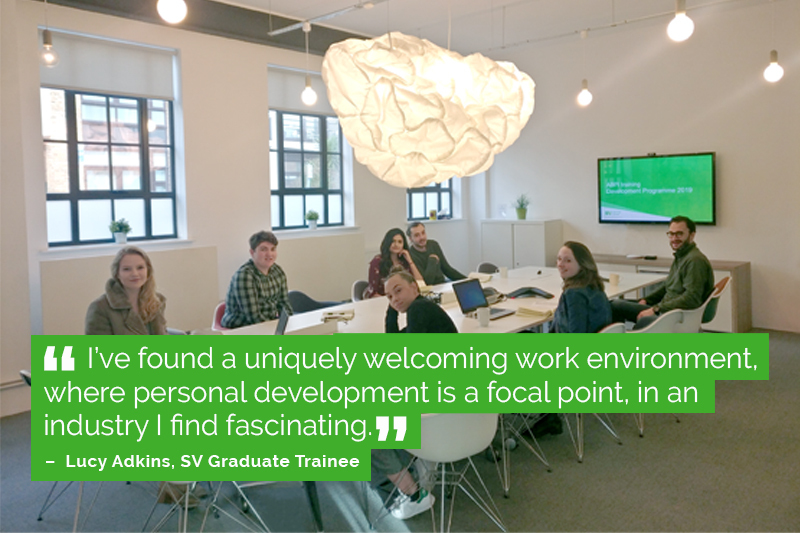 I’ve found a uniquely welcoming work environment, where personal development is a focal point, in an industry I find fascinating. I am impressed by SV’s commitment to their company values and delighted to be part of a team that has such positive and constructive ways of working. Much like university, I’m buzzing to get stuck in.